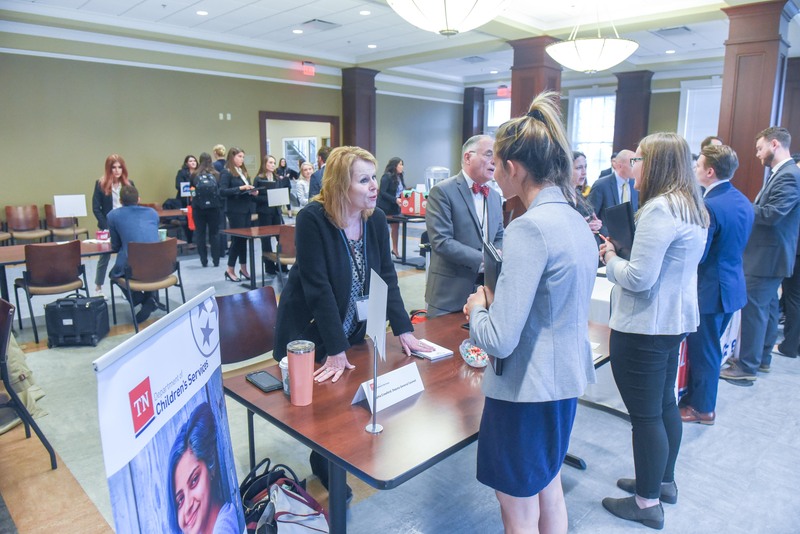 Employer Information Day at Belmont University in Nashville, Tennessee, January 23, 2019. The Office of Career and Professional Development at Belmont Law kicked off the spring semester with Professional Development Week in January. On Tuesday, January 22, representatives from Waller, Lansden, Dortch & Davis, LLP conducted an interview workshop with first year law students. Michelle Parsons, law school relations & recruiting manager and Tera Rica Murdock, hiring partner, presented information on the job search process from the employer’s perspective, as well as tips on legal interviewing. On Wednesday, January 23, first year law students participated in Employer Information Day. Students met representatives from private sector, non-profit, government and public interest employers from the Nashville area. Participating employers included the 16th Judicial District Attorney’s Office, 16th Judicial District Public Defender, Air Force JAG Recruiting – Reserve and Guard, Arts & Business Council of Greater Nashville, Tennessee Department of Children’s Services, Disability Rights Tennessee, Federal Public Defender’s Office, Tennessee Justice for our Neighbors, Leitner, Williams, Dooley & Napolitan, PLLC, Tennessee Attorney General, TennCare, The Fleming Law Firm & Mediation Center, U.S. Attorney’s Office Middle District of Tennessee and the Tennessee Trial Lawyers Association.